So we have installed Ubuntu in a Virtual Environment and know that some (or a lot) of the things in Ubuntu differs from windows, like filesystem and how removable drive works. 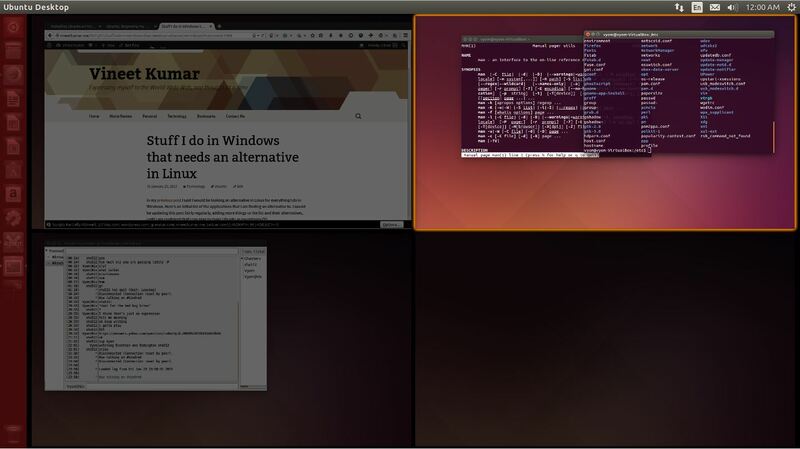 In this article I will be starting from a fresh install of Ubuntu and try to get familiar with the User Interface. In the upcoming post I will proceed to set it up with softwares and settings. I will literally be writing this article “while” I am using my PC, so this is not just a guide but more of a walk-through. Hence, please excuse my remarks which I sometimes make to emphasize my excitement (or disappointment) when I discover something. The taskbar is above the screen. It have the text “Ubuntu Desktop” written in right side of the taskbar. It also includes some icons on the top right corner including a clock and an icon on extreme right which looks like “Settings” icon. Unity bar which runs across the left side of the desktop, containing some icons of softwares like Firefox, Libre Office and System Settings. You will also notice an icon of Recycle bin down below. Rest of the screen is just plain desktop with no other stuff than default Orange wallpaper. Open Firefox from Unity bar and maximize it. Noticed something? Well you will see that the text “Ubuntu Desktop” written in the taskbar have now been changed to “Mozilla Firefox”. 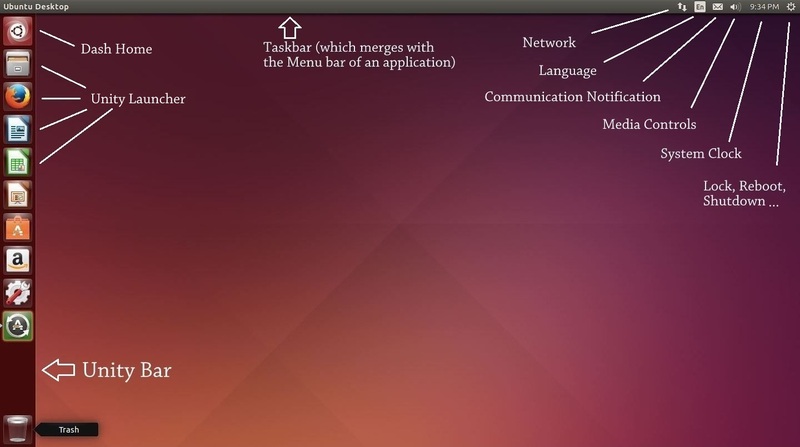 The first thing to note here is that the title bar of the application you open in Ubuntu is merged with the taskbar seamlessly. When you now hover your mouse on taskbar the Menu bar will suddenly appear out of nowhere. That is the dynamically changing taskbar for you, not visible when you don’t need it, but there when you want it. Neat! Next thing to note is that and which can bug someone coming from Windows background is that Application control buttons, i.e., Close, Minimize and Maximize buttons are on left side of the menu bar. So it might take some getting use to. You can close the applications now. The Taskbar also contains other icons which are for: Network, Language, Empathy and Volume control. The last icon is used to Lock, Reboot or Shutdown the PC. 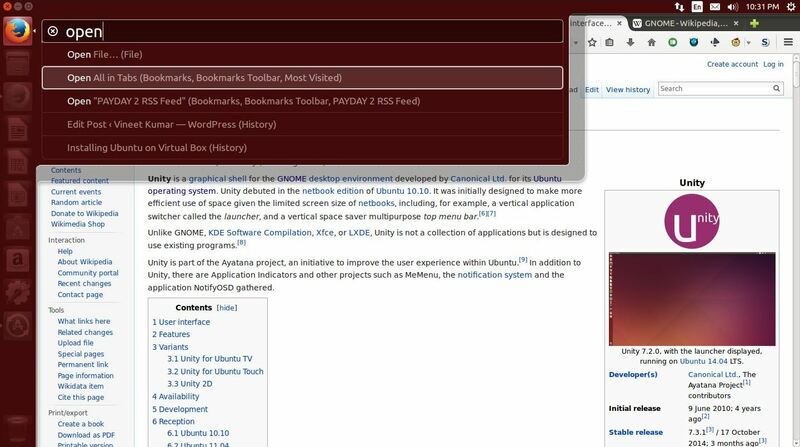 Unity bar is launcher and part of the Unity shell interface which Ubuntu comes with (since version 11.04). Let me first start with criticism about the Unity bar. The Unity bar is always in your face, consume screen’s real estate and tends to become cluttered with the increase in number of open applications. I hate it. 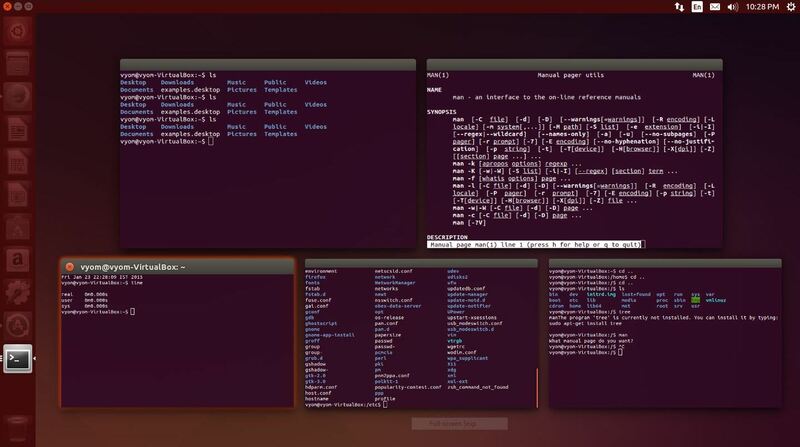 I have worked on Ubuntu before where default interface was GNOME and the sheer elegance of it surpasses Unity in every way. Now that is out of the way we can discuss some good things about this ‘strange’ thing. On top of this bar is something called, “Dash Home”. Clicking this icon (or pressing Windows key on your keyboard) opens up “Dash”, where you can search for any application (or files, music, videos etc) from the search bar. The bar also contains various Docks for various applications. A little white arrow on the left of the dock indicates that the application is currently open. The dock also groups multiple instances of the applications, allowing us to quickly click the dock and switch to another instance of the same application. Another very less known feature about Unity bar is the Head-up display (HUD). With this you can press and release Alt key and then start typing for keywords to look for any options under the Menu bar of the currently opened application. This allows for easy searching of any item buried under any levels of menu in seconds. It looks pretty nifty though have little idea about how useful it will be in regular use. Right clicking on the desktop can make a Windows user uneasy because of the absence of Refresh option that we are so accustomed to. Despite of the fact that the Refresh option use to do nothing except redrawing the icons, it use to give us peace at psychological level that nothing else could do. Well, you can “Refresh” in Ubuntu too for your peace of mind but by keyboard shortcut, “F5”. Then there are usual options to new folder, new document and changing background among others. Here you can click “Change Desktop Background” to change “Look” of Unity bar. You can lower the size of Launcher icons which would help Unity bar containing more icons before it starts to clutter. You may also want to “Enable workspaces” from “Behavior” tab which allows to have multiple desktops to separate your geeky life from other time wasting activities like browsing facebook. (Btw, Multiple desktops is one feature Windows is still struggling to provide natively in Windows 10, as far as technical preview is concerned). Apart from the Unity interface rest of the UI stuff is pretty much standard. You have “Files” in place of Windows explorer, “Trash” in place of Recycle bin, “Terminal” in place of Command Prompt and “System Settings” for Control Panel. But there is no Start Menu here, hence to see all installed programs at one place you would have to click “A” symbol in Dash (second pic in this article). So terminology is all we have to take care about. In the next article I will discuss about the almighty Terminal, central to every Nix OS and where most of the magic happens. 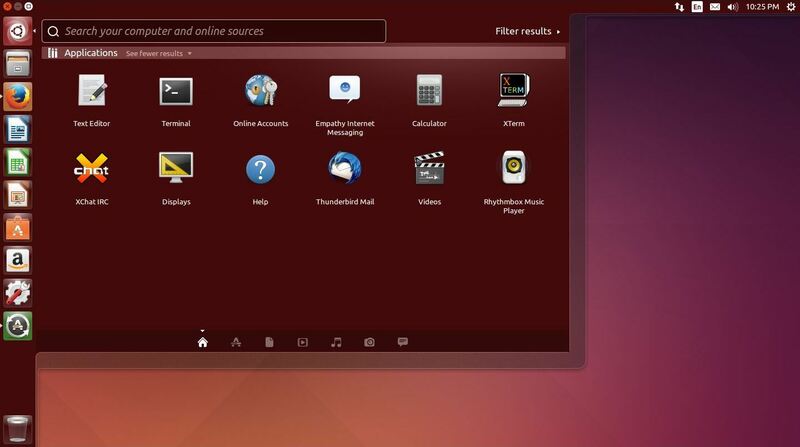 We will also update Ubuntu and install all the softwares we need to make our Ubuntu personal. Its what makes unity unique. Thanks for the suggestion. HUD is a very good feature that I really like in Unity. However I am more inclined towards GNOME for no particular reason. Maybe the modern UI. But I will try Unity again after some time. My opinion might change till then.